In the last few months, we’ve had more queries about how to write minutes than any other type of document. The feeling is that there is some magic to it, some special rules that need to be adhered to. This is not the case. When writing meeting minutes, you need to follow all the rules for planning and editing documents. 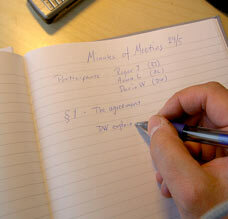 However, with minutes, there are some issues or topics you should take special care with. This article briefly outlines what these special issues are. Edit the document for the following. The Planning Model shows you how to use questions to help you plan any type of document. With minutes, the questions could be as follows. When was the meeting held? What were the main items or topics? What is the date, time and location of the next meeting? What items will be discussed at the next meeting? Next you need to establish a parallel pattern; a pattern of questions that you need to answer for each item or topic in the same order under each item. Let’s continue by writing the questions that need to be answered for each item. What was agreed to in terms of the next step? Who is responsible for any action? For each topic, make sure your document answers each question in the order in which the question appears, and you’ve established and maintained a parallel pattern. Parallel patterns are vital in all business writing as a technique to help structure documents effectively and to help the reader scan and read the document easily. Headings are another essential technique to help the reader easily scan and read your minutes. Therefore, use headings for the main sections of the document, as well as for each individual item or topic. Minutes are always written in the past tense. This is because you are writing about something (the meeting) that actually happened in the past. The exception to the past tense rule is governing body resolutions, which are written in the present tense because they will only happen in the future. To help keep the content concise and specific, whenever possible, write in the active voice. Active voice sentences follow subject/verb/object construction. Follow the rules for planning end editing documents when reviewing your meeting minutes.